Soo, I tried to make a mordrem-themed Sylvari outfit, though it's mostly just tier 3 Sylvari stuff with the necromancer's starter demon mask to give a sort of possessed look~ I tried the gem store Mordrem outfit and I mean it's quite a nice outfit, it's got these cool lumpy vein bits that pulsate, but for the gem cost I can't really justify it right now. The goal was to make her outfit look a bit like her staff, hence the blues which would otherwise be pretty out of place. Looking at it, I might need to adjust her shoulders so that they appear similar to her skin, since I wanted the mantle texture to look as if it were part of her, since Sylvari are all bumpy n' stuff anyways. I've got a Mordrem greatsword for her too, all ready for the expansion :3 ! 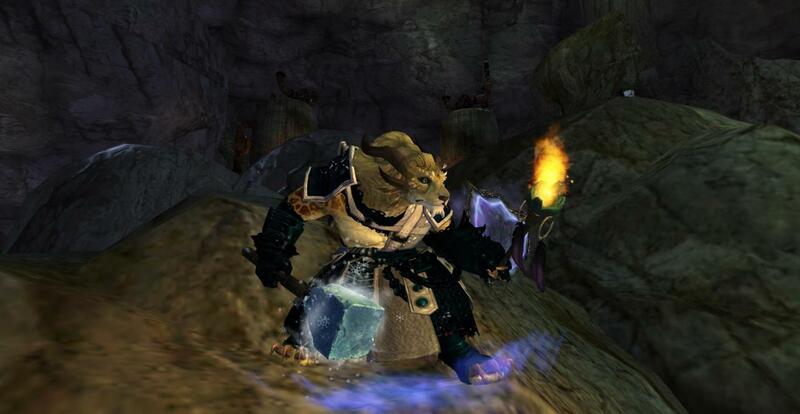 There is a distinct lack of both Charr and heavy armour, and as that combination is what I play, I'm saddened. Deeply. Another pirate look for Hrona Seabird. 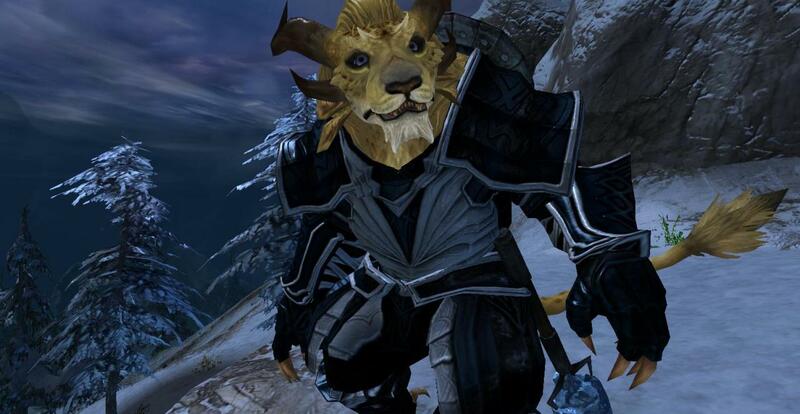 Ya want Charr? In heavy armour? This is Grishnack Soulclaw, Durmand Priory Archivist. 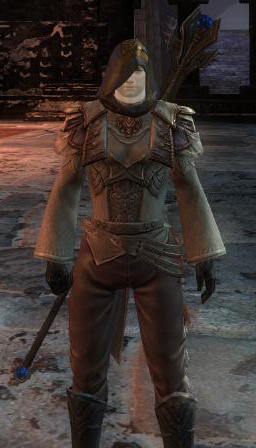 This is the official armour of the Priory that he wears. When not dressed for official Priory activities, he still has his armour from his old warband. Mostly made up of pit fighter armour. He also still uses his Priory torch and his mace Shiverstone. Right after I posed for this illustration for my upcoming book, The Remnant of Ascalon, there was an assassination attempt made against me. 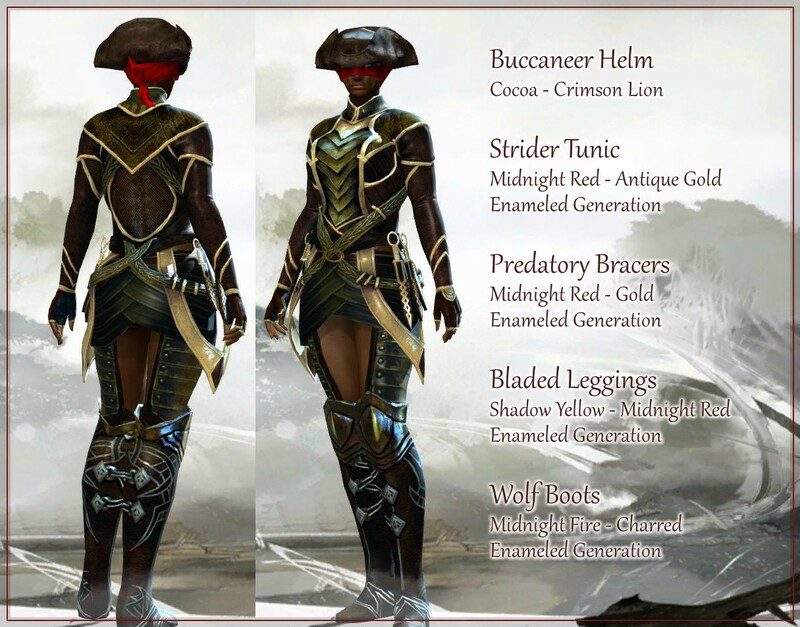 The armored components are a devout hood, magician's mantle, aristocrat's leggings, and diviner's coat, gloves, and boots. The dyes that were used: antique gold, ash, beige, charcoal, cream shade, and mischief. My girl, Beth Feywind, is a Vigil warmaster, just without the armor. She's the commander of a unit called the Shining Arrows. 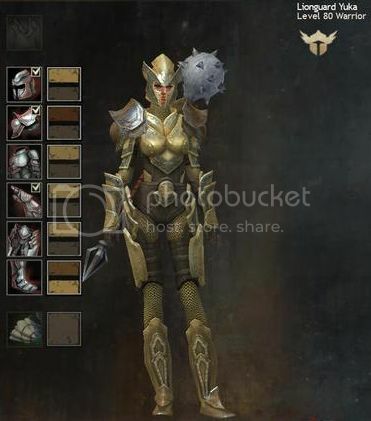 The armor look, just without the Carapace gloves and the Shining Arrows badge look is below. The yellow is Sand (not Mudmetal, contrary to popular belief), the Gray is Antique Bronze, the Brown on the pauldrons is Pottery, and the lighter brown on the boots is Wheat. All of the armor is of course Heavy Plate, as is the Lionguard standard for heavies. Have had some fellow Lionguard RP'ers try and contest my knowing that Sand is the infamous mustardy yellow that is the Lionguard armor primary. The reason I know I'm correct in this case is because unlike everyone else, who simply picked Mudmetal and decided it was close enough, I actually spent months going through every yellow swath and comparing to get it right. The reason I know I'm correct in this case is because unlike everyone else, who simply picked Mudmetal and decided it was close enough, I actually spent months going through every yellow swath and comparing to get it right. 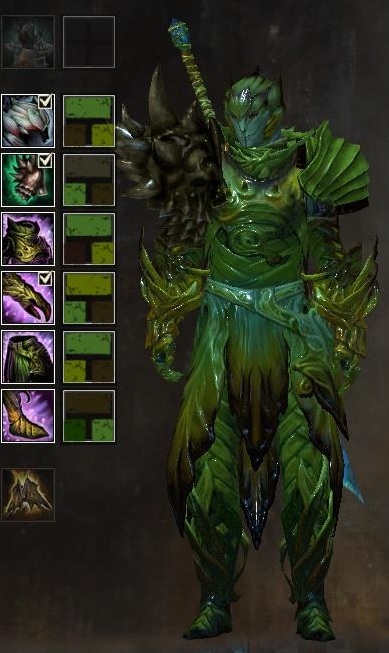 I spent no effort whatsoever into researching the greens and browns for my Warden, but here they are for anyone who wants a similar NPC look for their heavy-armor cabbage. Lol! You'd be surprised how much sass I got for that. You'd think I spoke some kind of dire heresy. When all along my meow was the right meow!